The Southern California Ford Dealers try their best to impart as much knowledge as possible to our loyal customers. When it comes to tires, we could fill a book! However, this time around we'll only take a bit of your time and talk about the proper way to rotate your car tires. Sometimes tires wear unevenly. A whole host of reasons can cause this problem, including over-inflation, under-inflation, road conditions, and driving habits. It is also true that front tires carry over 60% or your vehicle's weight and since we make so many right turns, that side might wear even faster. No matter how it happens, the goal is always to make a tire maintain superior traction and to have them last as long as possible. That's why Ford recommends that drivers have their tires rotated every 5,000 to 8,000 miles tire rotation. After you bring your car into a Ford service center in Southern California they will be able to tell you if your tires are worn. If they are, then it might be time for a tire rotation and balancing. 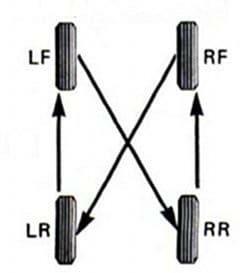 Let's take a closer look at the world of tire rotation. Before any tire rotation starts, technicians must decide whether you have directional or non-directional tires. Directional tires have a one-way tread, which means the tires are made either to be on the left or the right side of the car. Therefore when they are rotated it is back to front on the side they are designed for. Directional tires are clearly marked and it's a bad idea to rotate them any other way. Non-directional tires are just that, they can be put on any wheel and will work. 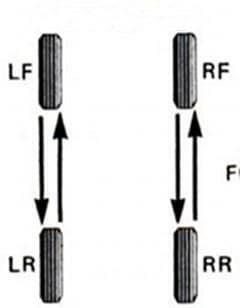 When you rotate non-directional tires, most experts agree that the back tires should go straight forward and the front tires should cross over the opposite rear side. If you have a front-wheel drive car this pattern is reversed. The last choice is when you have non-directional tires of different sizes on the front and rear. Obviously, you only rotate tires of the same size with each other. Now that the importance of tire rotation is clear, we want to weigh in on how our 69 participating Southern California Ford dealerships can help. Each of our members has a fully stocked service department with factory-trained technicians who use Ford Genuine Parts to repair and maintain your vehicle. If your tires are ready to be rotated, all you need to is make an appointment with us either by phone or online. If it turns out that you need new tires the Ford dealers in our group offer a wide variety of tire specials including a 30-day price guarantee on 13 major brands and a $25 rebate by mail when you use your Ford service credit card to make a qualifying purchase of $250 or more on tires. If you have any more questions about tire rotation, feel free to call or visit any of our participating dealerships today.